As a UX designer, it is my job to design digital products that move people into a state of flow, where they can efficiently accomplish their goals and experience happiness at the same time. Although I spend a lot of my time immersed in the digital world, I often find myself experiencing flow with the more old-fashioned technology of ink and paper. Having trained as an artist, it was through my formative experiences with all kinds of media that I understood the combination of exhilaration and fulfilment possible with a state of flow. At some point in my design career, I asked myself "How can I bring flow into my work?" According to Mihaly Csikszentmihalyi, the psychologist who pioneered the concept of flow, most people experience this state of intense focus and happiness when they are doing something they love. For me, that love is sketching. And I use that love to fuel the development of the flow-inducing products we create. For me, all it takes is the initial effort of putting the pen to paper, and as the ink itself begins to flow, so does my mind shortly thereafter. As visuals emerge, so does happiness. It might sound like a paradox, but lost in this happiness, I find my way to accomplish my goals. Before the pencil touches the paper, it's important to define what you hope to achieve from sketching. When this feels tricky, I often start by finishing this sentence: "At the end of my sketching experience, I would like to have a sketch that shows BLANK." For user experience designers, a goal might be to depict the wants and needs of target users. Perhaps you want to sketch what the value proposition of a product is according to the stakeholders, and then how a spectrum of users would react to it. Or you might want to get more concrete from the start, sketching a series of screens for a new user interface, imagining the journey for the user. Another tip: I also tend to write down my goal somewhere on the page. I encourage you not only to make the goal "achievable, " but to find the right amount of challenge, so your brain can really engage with the task. For some, the challenge might be the task of sketching itself. The key to finding flow is finding the right amount of challenge. If the goal you're hoping to accomplish with your sketch is too difficult, you are likely to become overwhelmed and anxious while sketching. These negative emotions make it difficult to achieve a flow state. Before you start, let go of your doubts. Once you begin, let go of judgment. One of the most important aspects of the flow state is complete immersion in the activity you're performing. Like a winding river's ceaseless flow downstream to the ocean, the person's attention in flow state is uninterrupted on its path to accomplishing a goal. To achieve this complete focus sometimes the hardest part is simply starting. I often find it helps to close the inbox and silence the phone, so that I can avoid these tempting distractions during the time between when sketching begins and flow ignites. With all of this in mind, do you have what you need at hand? It can take anywhere between 5 and 20 minutes to achieve flow, so you don't want to be scrambling for any materials once you have started. Find a favorite pen or pencil and a clean sheet of paper. Perhaps you have a special notebook and like to draw with markers. Or you have become adept at digital sketching on your tablet. Whatever it is you need, have it at the ready. And then, I'm ready to begin. Sometimes, you might not know exactly where to begin, and that's ok. My advice is to simply start doodling with the goal of visually representing the state of flow. For me, that looks like flowing water. Once I begin to get my hand moving, I then begin to shift my thoughts to the ideas around my goal. In this case, my goal is to create a set of screens for a parking payment app. In the first screen, I envision a message that explains the app's value proposition: allowing a person to pay for parking with their desired payment method, such as a credit card, without having to engage with a parking meter. I've just spent time circling a 4-block radius downtown, then I did a medal-worthy parallel-parking job with my SUV, and now I need to figure out how to pay for parking. I can't find change in my pocket!!! Now I'll really be late for my appointment at the bank... But wait! There's this new app I had downloaded just for this occasion. Now fully immersed in this scenario, I can clearly see my biggest challenge: understanding how the app works while contemplating how long I will be around the neighborhood, so that I can translate that time into how much I should pay for parking. Experiencing these moments in my mind, I realize people are juggling plenty of thoughts as they pay for parking. I continue sketching, knowing that choosing a payment method for parking should feel like a simple, easy decision. After I select and approve my parking payment, I imagine an animated message letting me know that my credit card payment is being processed. Still in this state of flow, I sketch this screen. And of course, once my parking fee is processed, I will want a confirmation that my payment was received. So, I sketch this screen as well. Once complete, I feel satisfied. 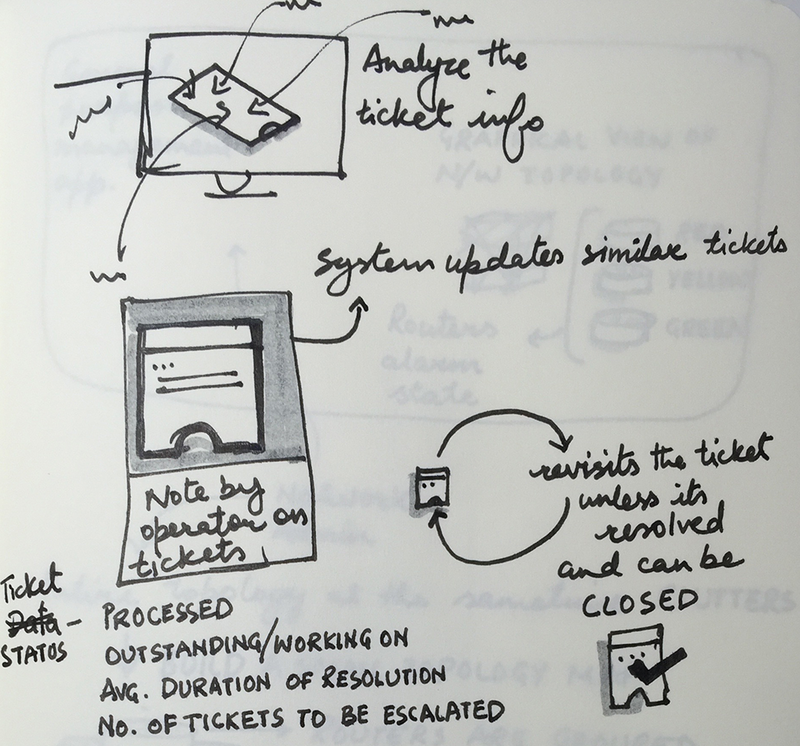 I accomplished my goals and enjoyed the experience of sketching with the user as my compass. I have a visualization of the screens for this parking meter app that are now ready to share with stakeholders for feedback. In this example, flow allowed me to separate myself from years of parking frustrations. Negative emotions from searching every cranny of the car for just another quarter to feed the meter or from discovering a paper ticket on the windshield after underestimating the scope of the weekly grocery shop are nowhere in my mind. In flow, separated from a lifetime of experience with parking meters, I felt free to pursue an idea in my sketch: What if we humanized the parking meter? Paying for parking would be less painful if the meter was friendly. 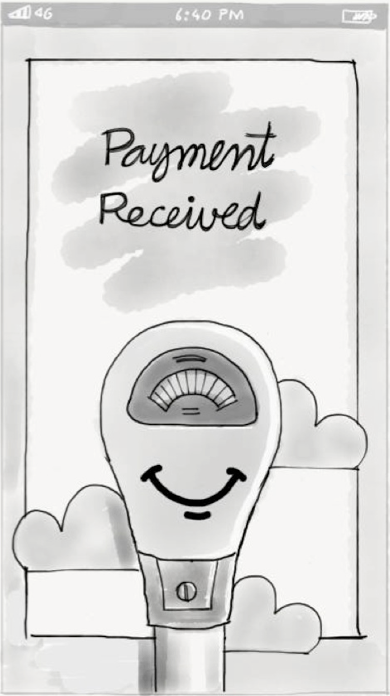 Hence, a smile made its way onto the parking meter in the sketch for the final screen. Flow quiets the self-doubt that leads designers to question their vision for products. Over years of sketching, I've learned that flow is an excellent state for coaxing out the most creative ideas. I believe flow quiets the self-doubt that leads designers to question their vision for products. 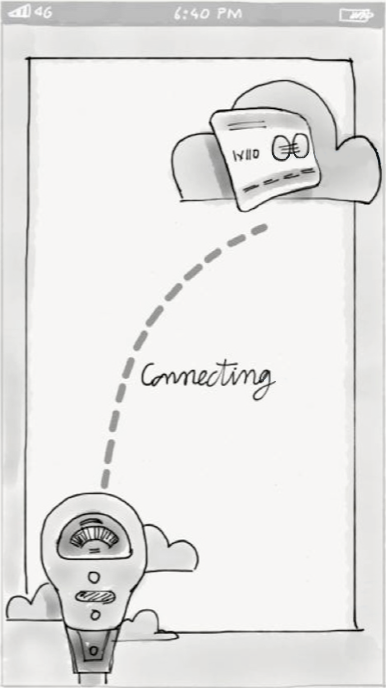 In the recently published book from the Google Ventures team, Sprint: How to Solve Big Problems and Test New Ideas in just Five Days, the authors highlight sketching as a crucial part of their design process. They share stories of stakeholders being skeptical of their artistic abilities, and show examples of how even the roughest sketch can have a large impact on a product. Interestingly, they propose that people in a team sketch individually for a while before bringing their ideas to the table. In fact, in their plan, sketching happens on a Tuesday, and those sketches don't get critiqued until the following day. I believe that part of their motivation is to create an environment conducive to flow. For me, flow is a creative experience with complete absence of judgement and negative thoughts. At the end of the experience, my sketches reflect a vision unrestricted by social expectations or stale thinking about a product's limitations, and provide a sense of satisfaction in my work. Most importantly, it's the act of sketching, not the medium that fuels flow. Whether you choose to use pencil, paper, an iPad or a whiteboard, it doesn't matter. Just sketch. Just sketch. 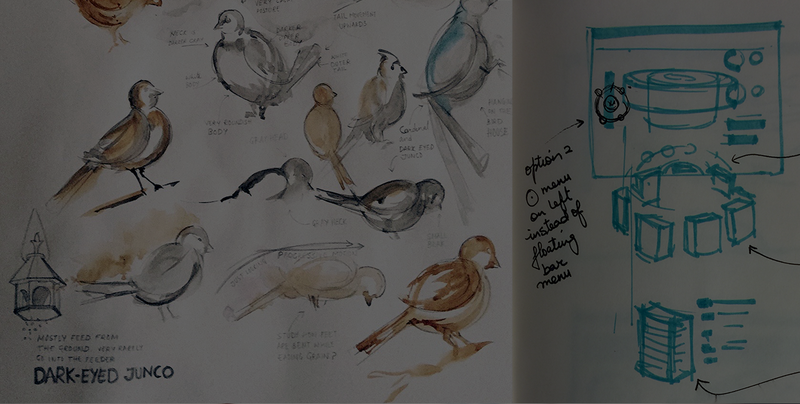 It's the act of sketching, not the medium that fuels flow and creative ideas. Ready to unlock your big idea?